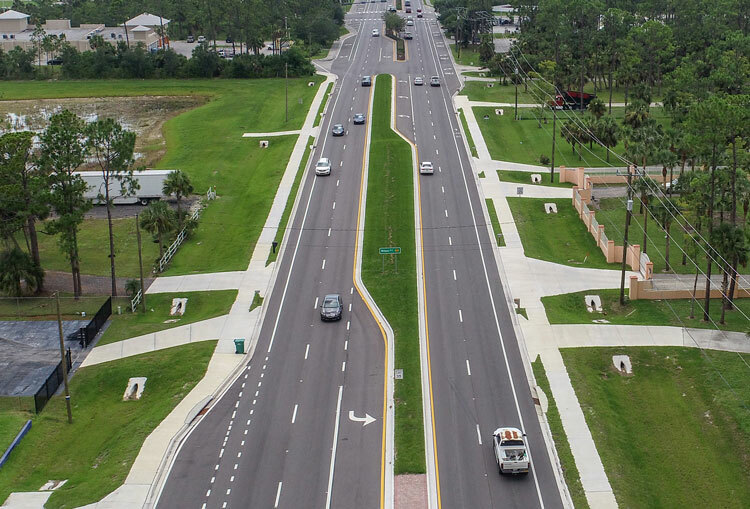 Naples, Fla. — The Golden Gate Boulevard Design-Build Improvement Project (east of Wilson Boulevard to 18th Street East) won an Honor Award in the Transportation Roadways Category for the 2018 Florida Region Design-Build Awards from Design-Build Institute of America (DBIA) Florida Region, Inc. The design-build team for the county project was Ajax Paving Industries of Florida, LLC and Stantec Consulting, a global professional services firm. Sub-contractors Guymann Construction performed the stormwater drainage system upgrades; Thomas Marine Construction handled the bridge-widening portion of the project; On-Grade constructed the earthwork, subgrade and base rock within the project; and Tincher Concrete Construction placed all the sidewalk and driveways for the project. The approximately two-mile section of Golden Gate Boulevard was widened from a two-lane rural roadway to a four-lane urban roadway. An urban roadway includes curbs and gutters along the outside lanes and along the medians. Other features include turn lanes at every side street with U-turn accommodations, and the widening of the bridge over the Golden Gate Main Canal from two lanes to four lanes. With traffic projections of more than 29,000 vehicles per day by the year 2035 (according to the 2035 Long Range Transportation Plan), having the roadway widened to four lanes not only alleviates traffic congestion but also helps with added safety improvements including on-street bike lanes and 6-foot sidewalks on both sides of the roadway, along with school bus stop features (including bike racks at intersections and a shelter at Golden Gate Boulevard and 16th Street SE). “One of the major benefits of the project is the creation of a median divided roadway (two lanes eastbound and two lanes westbound) where residents don’t need to stop for school buses in the opposing direction,” said Collier County Transportation Engineering Division Director Jay Ahmad. Ahmad said that this is not only a safety benefit but also a big help with Golden Gate Estates residents’ commute to work in the morning during peak traffic hours. The project was completed on-time and within the approximately $20 million budget despite being in the path of Hurricane Irma two months before completion. The award will be presented at the 13th Annual Conference of the DBIA Florida Region on Oct. 4, 2018.